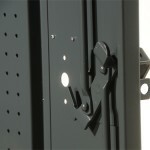 The Sentry I latch provides a 3-point/3-sided latch for optimal security. With an all-welded hinge, it provides 4-sided security with 3/8" diameter steel rods that fit smoothly into the top and bottom of the frame. This latching mechanism will accept a padlock or a built-in deadbolt. The Sentry I latch is available on all angle iron and formed sheet metal doors with a door height of 18 inches or taller. The Sentry I-R latch features a finger-lift mechanism which operates a 3-point /3-sided latch in a flush mounted stainless steel cup. This latch can be used with either a padlock or a built-in deadbolt. 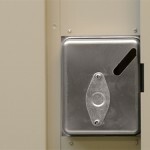 The Sentry I-R Latch is available on all formed sheet metal doors with a door height of 18 inches or taller. The Sentry II latch features an easy to use gravity lift latch system. The door can be closed with the latch in the lock position. 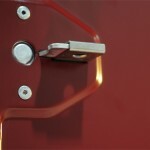 This latch can be used with a padlock or a built-in combination lock. The Sentry II Latch is available on all formed sheet metal doors with a door height of 18 inches or taller. The Sentry III latch has no moving parts and is featured on a standard double panel door for a high security, quiet closing door. This latch mechanism will accept a built-in springbolt or a deadbolt. 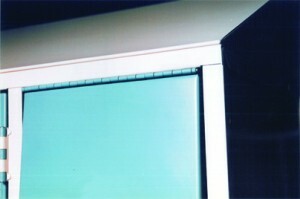 The Sentry III Latch is available on all formed sheet metal doors with a door height of 12 inches or taller. 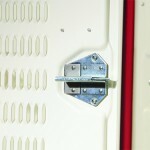 The Box Locker Spring Latch assures positive closing action. 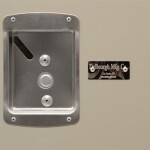 A stainless steel hasp prevents corrosion plus protects the locker finish. This latch accepts a padlock only. 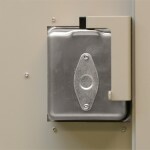 The Box Locker Spring Latch is available on all formed sheet metal doors with a door height of 15 inches or shorter. DeBourgh's 5-knuckle hinge is the strongest, longest-lasting hinge in the industry. Constructed of 14 ga. steel and welded to both the frame and door for invincible strength and low maintenance using fast, tight pin construction. 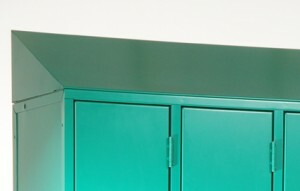 This hinge is available on angle iron and formed sheet metal lockers. The 16 ga. piano hinge is welded to the door and securely attached to the full length of the door frame. 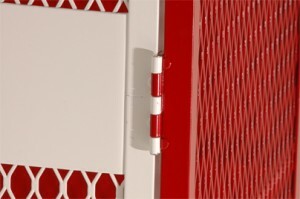 This hinge is available on formed sheet metal lockers. The box locker top piano hinge will survive the test of time! This continuous hinge is made of 16 ga. steel and welded to the door. 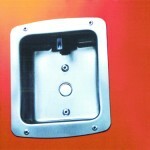 This hinge is available on angle iron and formed sheet metal lockers. The DeBourgh knife hinge features a 3/16” diameter hinge pin which is welded to the locker door and anchored into solid brass bushings. 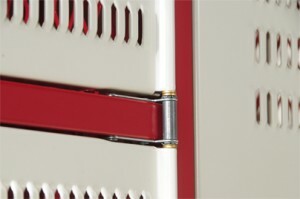 This hinge is designed to remain open while the locker is in use. 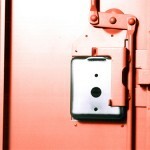 This hinge is available on angle iron and formed sheet metal lockers. 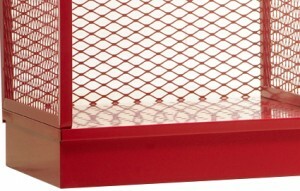 Sloped Tops prevent accumulation of books, clothes, and other materials on top of lockers. 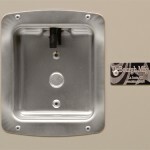 DeBourgh constructs the 18 gauge slope top as a separate unit from the locker. 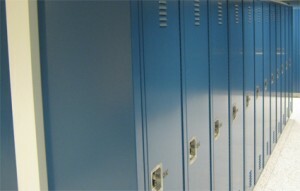 This allows the lockers to be moved into a recessed area at a later time if desired. The slope top is attached at the factory with tamper proof fasteners to reduce installation time. When no built in floor bases are available, the closed base provides unparalleled strength and off-the-floor protection. A rugged 14 gauge, 4 inch base is welded to the bottom of the locker at the factory. 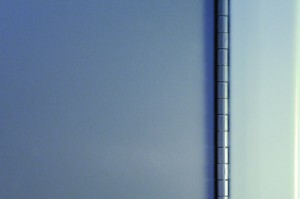 DeBourgh's 16 gauge Solid End Panels can be used at the end of a locker row or in void areas to provide an attractive, finished appearance. 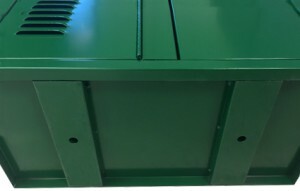 The 16 gauge U-shaped spacer channel reinforces the locker bottom allowing for easier installation and strengthening the integrity of the entire locker unit when closed bases are not used. 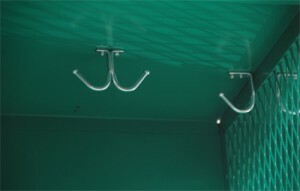 Forged steel hooks are the strongest in the industry; Our hooks are zinc coated for corrosion and wear resistance. 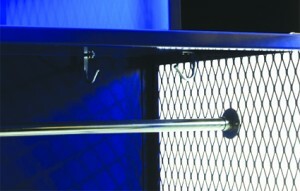 The optional Clothing Rod is strong, durable and heavy plated for long-term use.